Below, you’ll find a summary of all the features added in this release with links to more detailed information. For table and matrix visuals, we have the additions of cell alignment, display units, and precision control for individual fields. We’ve also extended conditional formatting to include rule-based conditional formatting. 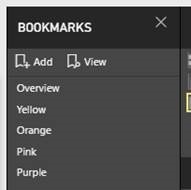 Now, if you have specific business logic to reflect in your table or matrix, you can create rules to conditionally color the background or font color of a column. For data labels on bar and column charts, you can now overflow your data labels past the bar’s boundary. Additionally, for Cartesian charts and maps, you can also control the background color and transparency. 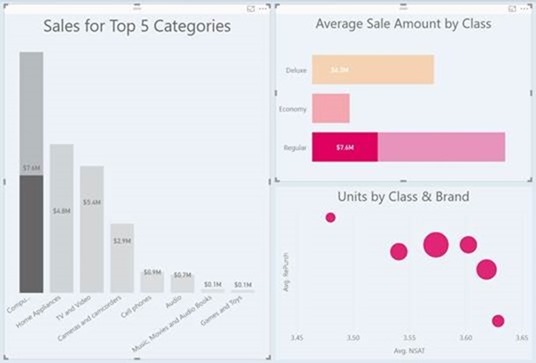 There are new formatting options for the axis of bar and column charts as well. You can control the padding between categories and increase the percentage of the chart used for axis labels. For scatter charts, we’ve added a way to plot your data without having to group it on a category through the details bucket. If you are using our Bing maps with latitude/longitude data, we’ve enabled high density sampling that better preserves the shape of your data while also surfacing outliers. We added two new features for our slicer visual. The first is responsive slicers, which lets you resize them to a variety of different sizes and shapes, from horizontal to square to vertical, and the values in the slicer responsively rearrange themselves as you do. For relative date slicers, we also have a feature to let you set a specific anchor date instead of it always being relative to today. Our new bookmarking feature lets you save specific states of your report. 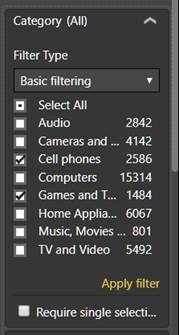 This state can include filters, slicers, cross-highlighting, what charts are visible or not (set through the selection pane), and everything else that makes up your current view. You also have the flexibility to control what part of the report’s state is included in a bookmark. Once you have several bookmarks, you can then play through those states in a specific order to tell a story. 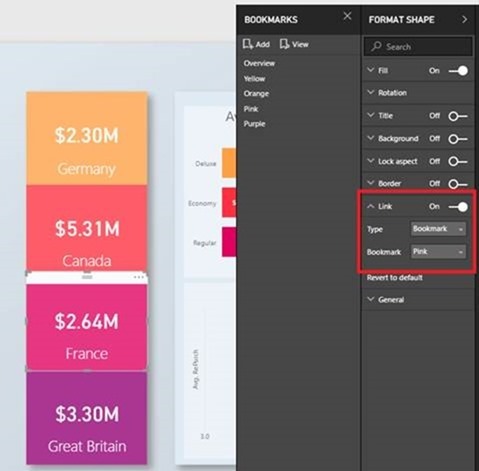 You can also tie a specific state of your report to images or shapes, and when someone clicks on that image, it will load that specific state. This lets you set up custom navigation and create an interactive app-like report that changes as users click around. 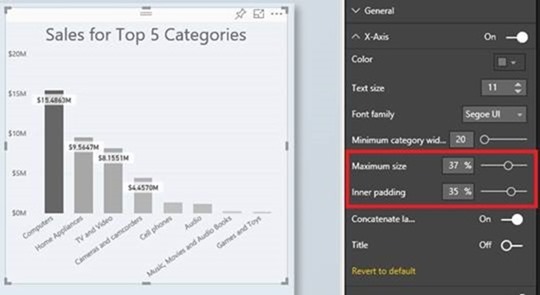 To make your report more app like, you can also hide pages in your report. In addition to letting you hide work in progress, this also lets you hide pages you don’t want users to navigate to directly and force them to reach that page through bookmark links or drillthrough. You can also disable the visual header in reading mode which can give your reports a much cleaner and app-like look. We’ve also added several reporting features to improve interactivity. You can now cross-highlight across multiple charts on a page. As a report creator, you can also sync slicers across multiple pages of your report. If you set this up, if a user selects a specific slicer value on one page of their report, it will apply to any report pages that are synced with it. If you have a report connected to a slow dataset, we give you report options to help reduce the number of queries being sent. From one place, you can add an apply button to all slicers and filters in your report. This means users can make as many modifications to their slicer or filter as they want and then once ready apply it. From here, you can also easily turn off cross-highlighting for your report. In addition to add new reporting features, we’ve added improvements that make easier for authors to create reports. We’ve improved the default placement of visuals when they are added to a report page, so you don’t have to resize and move the visuals as much. When you do need to select and rearrange objects on your report, you can easily select and change the z-order of visuals through the selection pane. Once you have your layout set and all you need to do is format and test your report, it can be easy to accidently move visuals while clicking on them. To help with this, we’ve added a way to lock visuals in your report, so they can’t be moved or resized. When formatting your visuals, we have so many formatting options now for visuals that it can be hard to find what you are looking for, so we’ve added a search box to the formatting and analytics panes. Lastly, if you have multiple people editing your reports, you can add descriptions to the fields of your model. This is a great way for everyone to understand what fields they should use and how measures are being calculated. We want to make it as easy as possible for you to analyze your data, including helping you create new DAX measures. 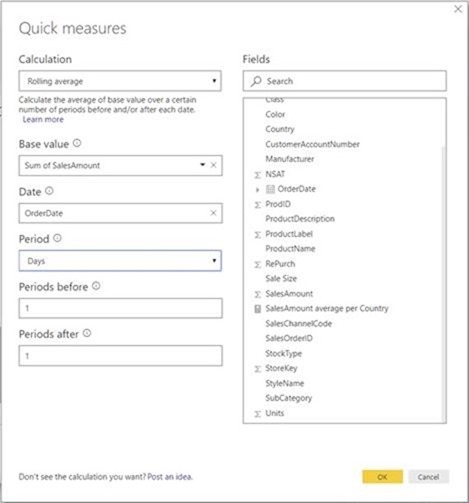 Quick measures is a new feature that lets you quickly create new measures based on other fields in your table. These new measures become part of your model and can be used in any of your charts, just like manually created DAX calculations. You can also see the underlying DAX and edit it if you need to tweak the results. 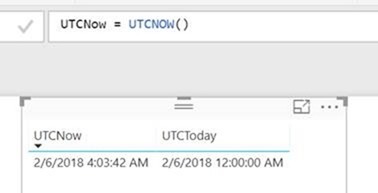 Another DAX improvement is the addition of two new DAX functions that help if you're working with date-time data across timezones. UTCNOW() and UTCTODAY() will always return the current time or date in UTC so you can guarantee consistent results wherever you are. If you have your own date table, you can now mark them as a date table in Power BI. We will then remove our built-in date tables, and you can start using this date table in your datetime quick measures. When analyzing your data, drilling down can help you find interesting insights. With this update, we are adding the ability for other visuals on your report to be filtered as you drill down in a visual, which will help you find even more insights in your data. The last analytics feature for this release is extending our cell-level formatting support to multi-row cards. This means that for table, matrix, single value cards, and multi-row cards, cell-level formatting defined in your multi-dimensional Analysis Services (AS) model will automatically flow through and be applied. Optimized use of TREATAS in calculations. You’ll also see improvements when opening and saving large files and when using the “Show items with no data” feature in visuals. Lastly, there are a few improvements that don’t fall into any category. We’ve added a new option to our Help ribbon, Consulting Services. From the new Consulting Services resource on the Help ribbon, you can explore a wide variety of curated fixed price, fixed scope, and fixed duration consulting services from our vibrant partner community. We’ve also updated our Power BI Desktop error reporting experience in this update. If you hit an exception while using Power BI, you’ll be shown a dialog where you can optionally send us information to help us investigate the issue and improve the Desktop. 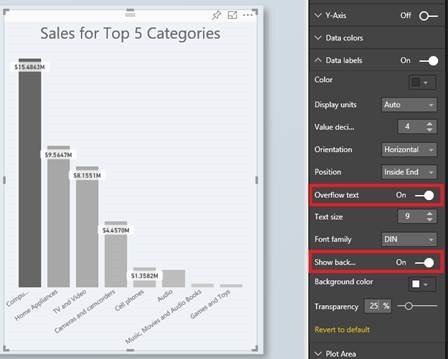 You’ll be able to do this completely inside Power BI Desktop. This new experience is also hooked into Windows Error reporting, so you can view your previous error information in the same place as errors from other Windows applications. That’s all for this update! We hope that you enjoy these updates and continue sending us your feedback.